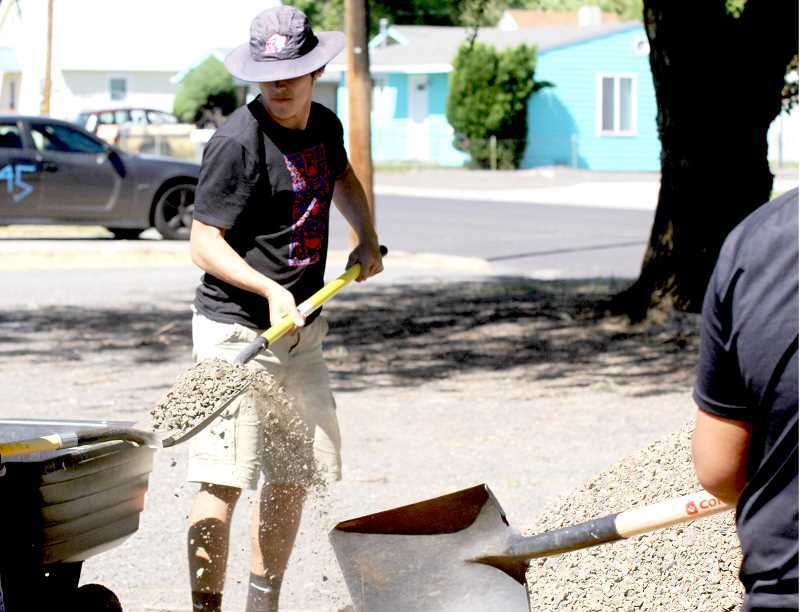 The football team goes around Madras giving back to the community with different tasks on June 1. 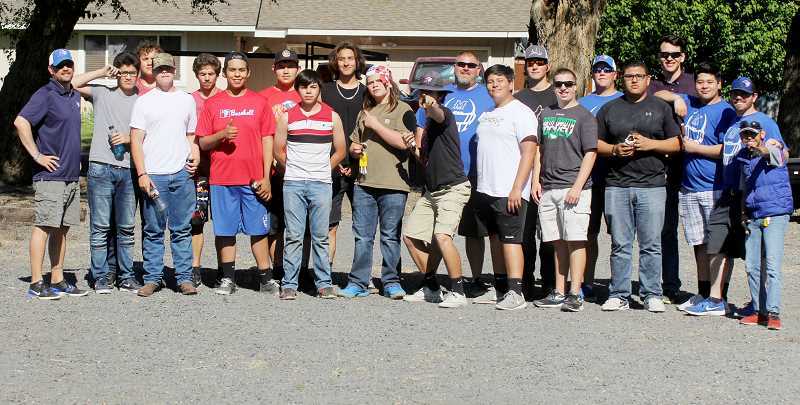 The Madras High School football team held a service day Friday, helping the community. The football program followed one of its core values by going around Madras with the mindset of giving back to the community. The program developed core values called DESIRE, which breaks down into six values they try to uphold. Discipline, effort, service, integrity, respect and excellence are the principles on which the White Buffalos base their football program. On June 1, the team gathered at the Madras Gospel Mission community center, helping with a variety of different tasks. 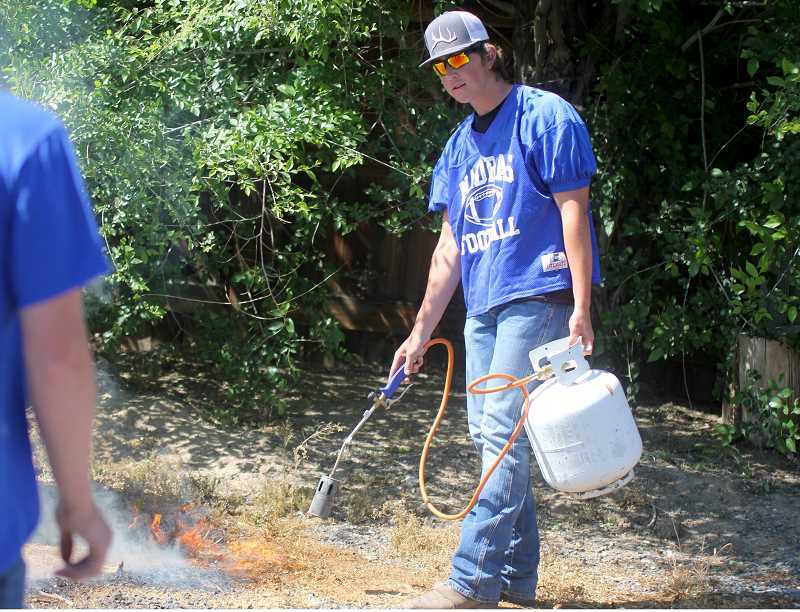 The football program shoveled piles of gravel and spread them evenly in the parking lot, burned down weeds, moved dumpsters and provided other services. They also went to the Madras community garden, dug trenches and cleaned it up. Head football coach Kurt Taylor borrowed the idea from George Fox University. During coach Taylor's time at George Fox, the entire student body would go around the community, providing different services. "When I was at Fox, I knew when I became a head coach it was something I wanted to do with my team," said Taylor. The football team had about 25 athletes helping with their service day, gaining numbers as the day continued. "This teaches the players to serve their community, which is huge for us," Taylor said. "We always talk about being an outside, inside community. The more we serve our outside community, the more likely they are to serve us as an inside community — whether that is them coming out and attending our games on Friday night or helping us financially attending a George Fox football camp." "We want the community to know that is what we are about," said Taylor. "We want to be about community here, especially in Jefferson County, where it means a lot to stakeholders." "We want to give back to the community, so they can be there and help support us," said athlete Keenan Miller. "This brings our team together. It is bigger than just our football team; we are able to give back to everyone. I hope this shows the community our effort and how we are truly about DESIRE." Miller is heading into his junior year at Madras High School and plays quarterback and safety for the Buffs. "We're trying to show that we are committed, showing the community we are here," said Dalton Waldow. "The community does a lot for us, so we need to do a lot for the community. They donate a ton for us, so we are donating our time, trying to make this community better." Waldow, heading into his senior year, earned honorable mention as a safety last year. He helped the White Buffalo defense hold their opponents to an average of only 99 yards passing per game.